It was a chilly day by this winter’s standards. The WNW breeze was shifty and challenged the racers. 30 boats competed in 5 races over a pretty long windward-leeward course. Join us on the first day of 2014 for PRSA’s annual Hangover Regatta. There’s no better way to nurse a hangover, or recover from yet another challenging year, than by celebrating with the PRSA Laser fleet and racing with us on the Potomac River. Skippers meeting will be at 12:00, first races at 12:45. NOR, pre-registration and directions are here. It was another great turnout for the Hangover 2012 edition. We had 29 boats on the water just shy of thirty. Thanks to all those who traveled to make it close to the thirty goal. The weather helped draw people out, with temps in the upper fifties and southerly wind 5-12 knots, can’t beat that for the first of January. The RC Nabeel, Cassie and Alex Jacobs friend set up a windward leeward gate course. The wind was not very shifty at all and a good start and boat speed were the key for the day. There was close sailing all over the course and there were many photo finishes. The top overall spots were up for grabs till the last race. Mr. Consistency (aka Len Guenther) continued his form into 2012 with two three, two fours and five to end up in fifth for the day. Third and fourth overall was a tie and they tied in a race with Alex Jacob winning the tie break for third place and Erich Hesse in fourth place overall. RJ Bay from WRSC iced second overall by winning the last race. James Jacob was the most consistent with 9 points in five races and sailing on his rail at points. Special thanks to Scott and Nabeel who helped me pull it together. 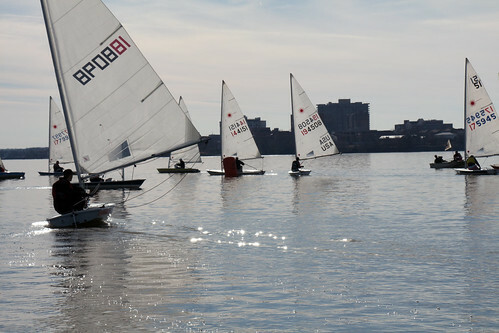 Potomac River Sailing Association will hold their annual Hangover Regatta on Sunday, January 1. All Laser sailors are invited for some New Years Day frostbiting on the Potomac River at the Washington Sailing Marina near the Regan National Airport. Expect registration to start around 11 with a skipper’s meeting at noon and the first warning at 1245. Frostbiting attire such as a wetsuit or drysuit is required. For more information contact Erich Hesse.